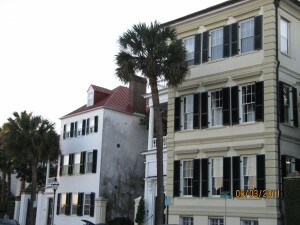 Sorted out our cell phone/internet before arriving in Charleston. As IPhone owners from Canada we couldn’t find a budget friendly option for US service using our Canadian service provider. So we cracked our phones and dropped by AT&T in New York state. According to Toby – the rep at the store – smartphones are not available in the US on a pay-as-you-go plan. Contracts are the only way to go with a minimum one year committment. He called AT&T HQ and in short order put us onto a deposit-free plan that we could cancel after six months. Thanks Toby!! 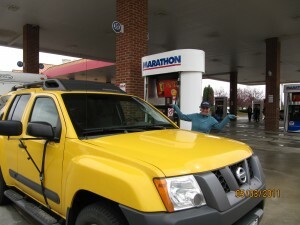 We also ran into the first of many gas stations that require a ZIP code to pay-at-the-pump. A quick call to our US Visa provider set us up with a code to use at gas stations. Marianna discovers that without a Zip code (the US version of postal codes) you can't pay-at-the-pump. Arrived in Charleston around 6pm and set up in a nice campground spot on James Island – which is very close to Charleston. 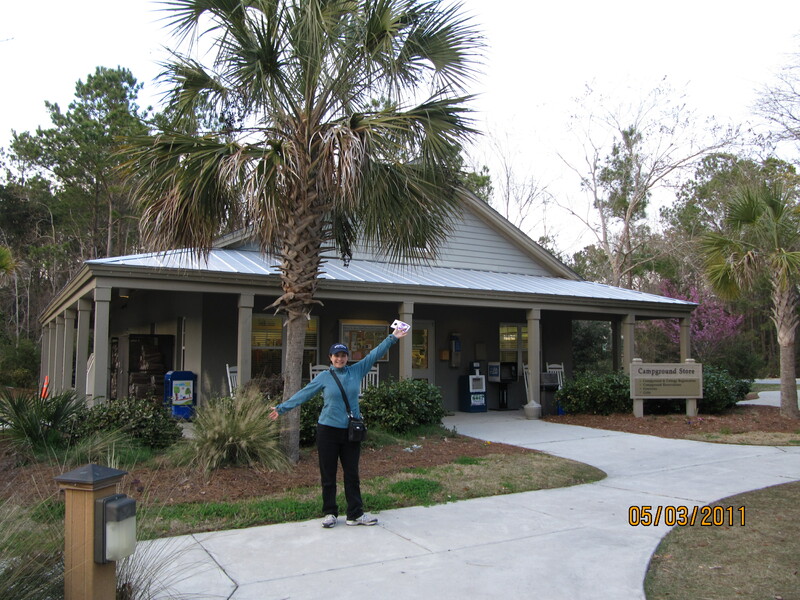 Palm trees greet Marianna at the James Island County Campground gatehouse. 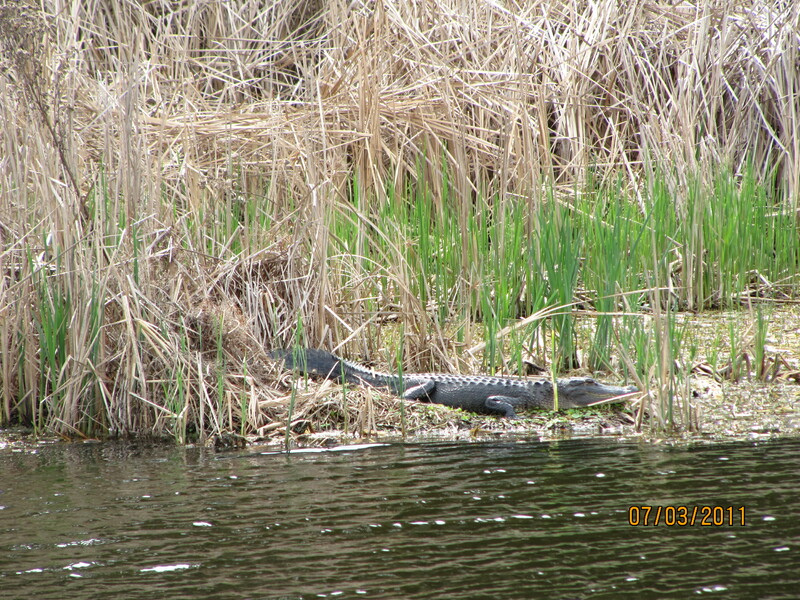 The next day, we visited Jason’s cousin in Summerville. 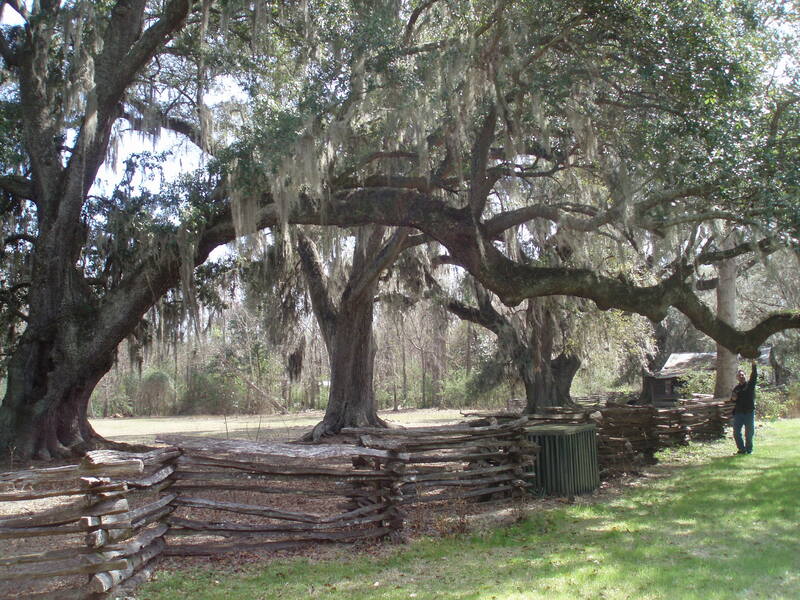 This neat town came about when Charleston plantation owners sought refuge from mosquitos. 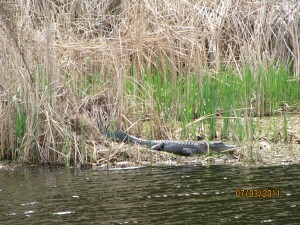 We had a great visit with the family! 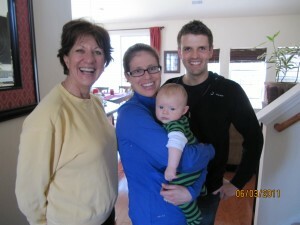 L to R - Auntie Elaine Robinson, Cousin Meredith holding Augustin, and Cousin-in-law Joachim. 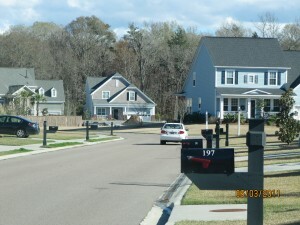 Meredith & Joachim's home is located in this quant little Summerville subdivision. It interesting that each and every house gets a fancy mailbox - just like the old days. 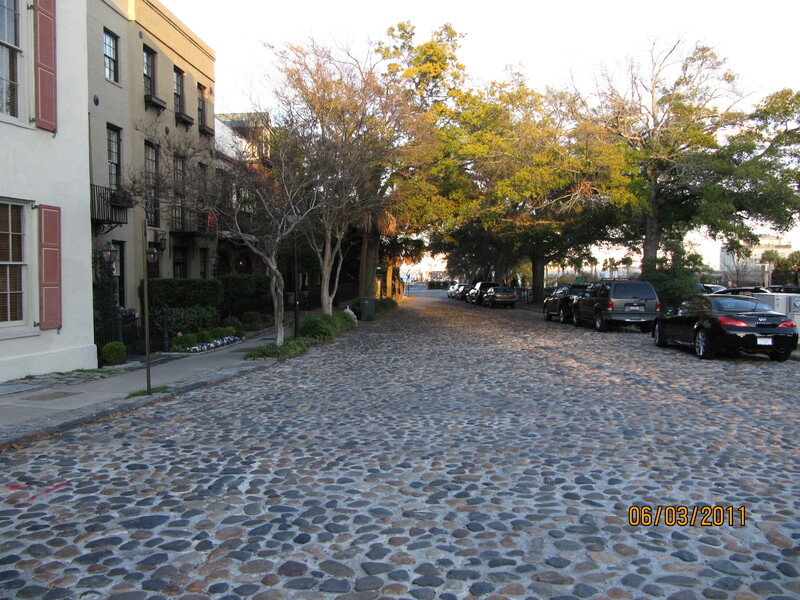 We spent the rest of that day walking around Charleston’s historic district. 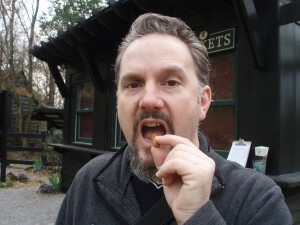 The Pralines were delicious – thanks to everyone for the tip! If you have the chance to sample one of these sweet treats, be sure to do it. 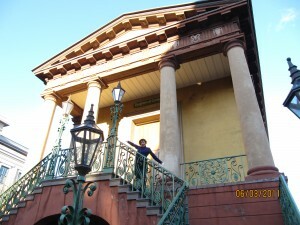 Marianna takes in one of the historic buildings in Charleston. Cobblestone streets add to the city's character. Beautiful homes along the waterfront. What a find - boiled peanuts! 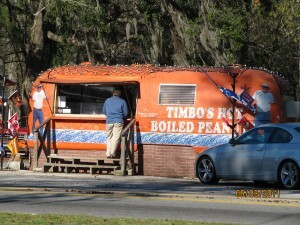 Timbo's Boiled Peanuts to be exact. The shell is soft and peels of easily. The peanuts are mushy (think peas). 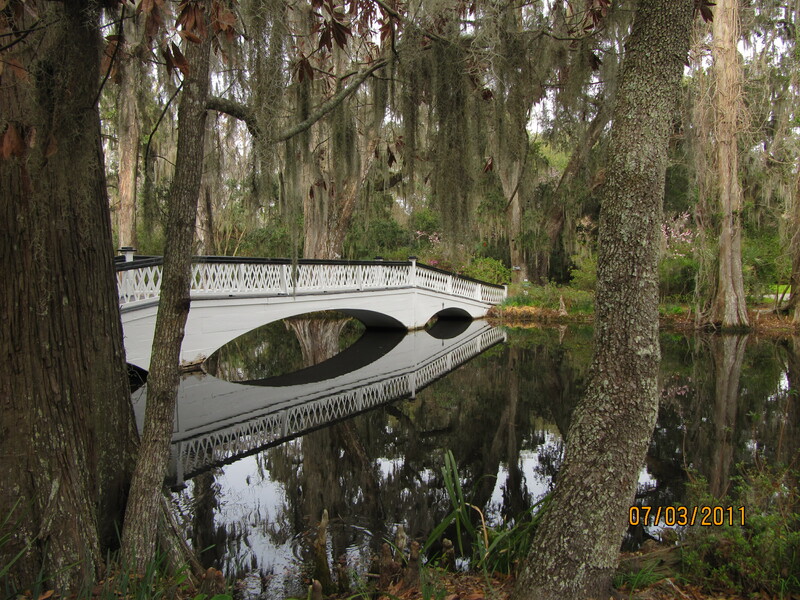 A trip to this area isn’t complete without visiting at least one plantation so we spent the following day touring the gardens Magnolia Plantation – absolutely beautiful! Jason checks out Magnolia Plantation's old oak tree and its long branch. 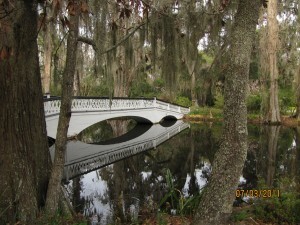 Magnolia's gardens feature numerous bridges, ponds and flowers that bloom all year. 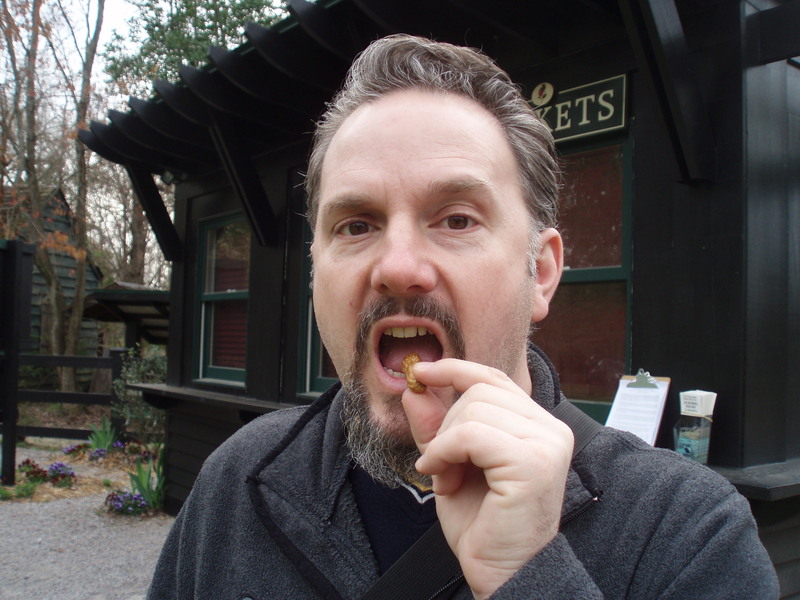 Magnolia's cafe offered up Deep Fried Peanuts - eaten shell and all! 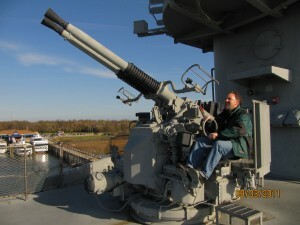 Jason bravely tries one. Crunchy, fibrous, and overall, not bad. That day we also discovered dirt cheap wine!!!! Wine we typically buy at home for $13 is $5 at a store called Total Wine. 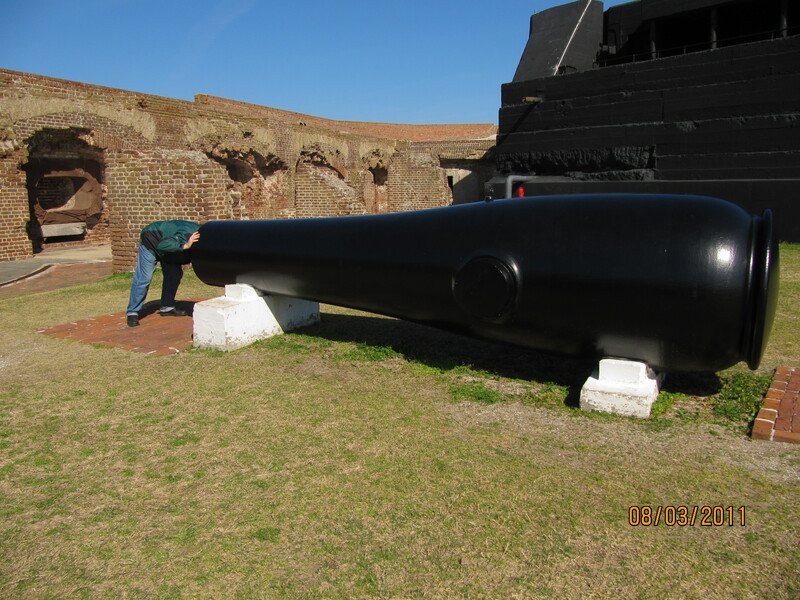 The next day we were off to tour Fort Sumter – where the first shots of the Civil war rang out. 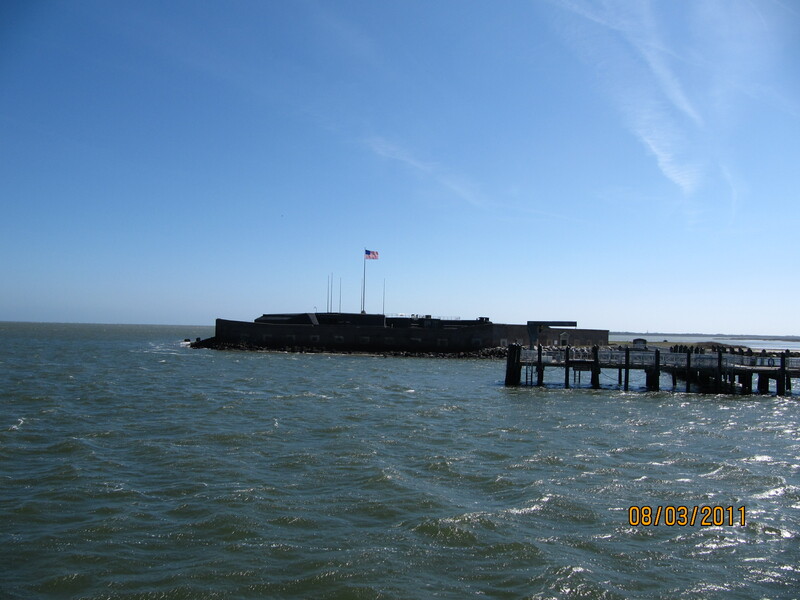 The boat ride out to the fort provided great views of Charleston’s harbor. Jason inspects a cannon while Marianna checks out the trigger mechanism - teeheehee. 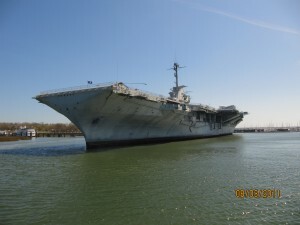 We also toured the WWII aircraft carrier YORKTOWN. When on active duty, the Yorktown had approx. 3,000 people on board. Jason tries his hand at anti-aircraft weaponry aboard the Yorktown. 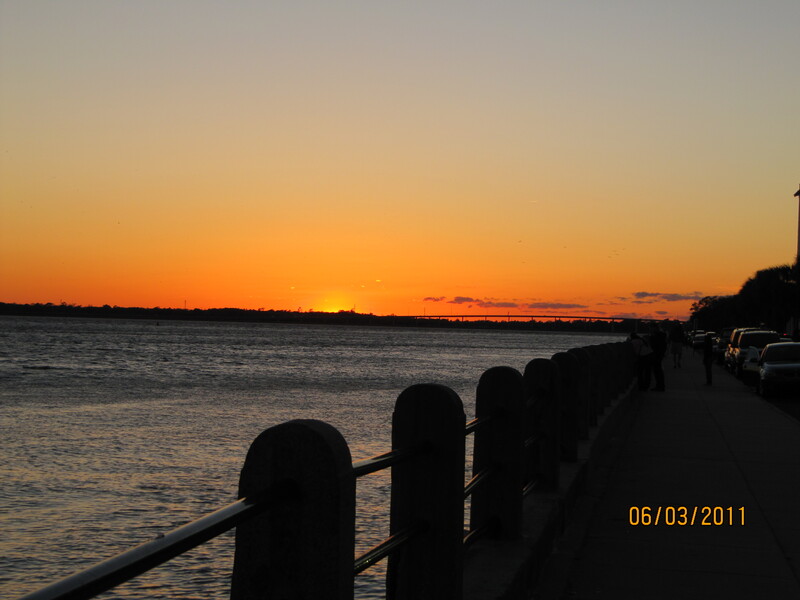 Our last day in Charleston was spent organizing our trailer for cross country touring and visiting Folly Beach. 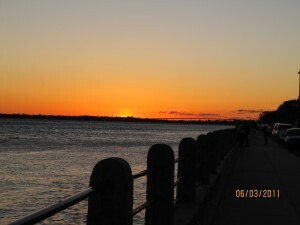 Folly Beach is another state park that is closeby and beautiful – although it was quite chilly the day we visited. 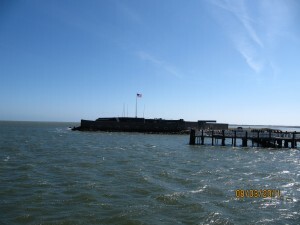 Admission fees are included when you stay at James Island County Park. 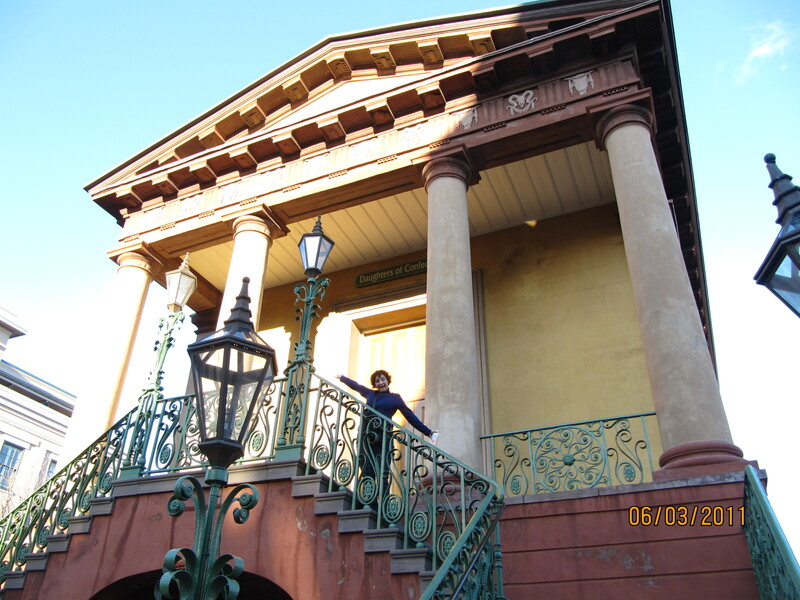 Next up – Savannah, Georgia! Dirt Cheap Wine??? So much for swearing off alcohol for 6 months!! Heathens!